Pandit Raghunath Sharma, founder of the Hindu Samaj, was bom in the Sialkot district of Raipur, in that part of the Punjab which is now in Pakistan, circa 1898. He was educated in Lahore and specialized in the study of the Sanskrit language. 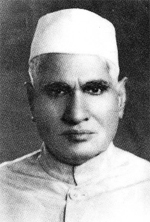 Pandit Sharma arrived in Bangkok in December 1923 and returned to India in 1970 to stay with his family. He died in Madras that same year. Pandit Raghunath Sharma was a selfless person; whatever he did for the community, he did without any selfish motives. In the early ’20s, although other groups of Indians had already organized their own religious foundations and associations, the Punjabi Hindus, though present in Bangkok since 1883, still lacked a real fulcram for religious and educational activities. When he arrived in Bangkok from India at the end of December 1923, Pandit Raghunath became the driving force to form an association for this isolated, focusless community. At the beginning, Pandit-ji started Kathas of Ramayana (recitals and readings of the Ramayana epic) in a small place in Pahurat Road. These Kathas were very well attended and for the first time, a feeling of identity began to emerge. Soon, an aware¬ness also began growing in the Punjabi community and with it, the need to have premises of their own for their cultural and spiritual needs. As a result, the precursor of the Hindu Samaj, the Hindu Sabha, was formed under the guidance of Pandit Raghunath. The first rules and bylaws of the new association were also laid down by him and they remained in force until 1966- 67, when the present constitution of the Hindu Samaj was drafted by a committee of four comprising Tarlok Nath Pawa as the convenor, and Messrs Darshan Singh Bajaj, Ajit Singh Sachdev and Shrimati Krishna Pawa. Soon after the inauguration of the Hindu Sabha in 1925, on the auspicious day of Vijaydashmi, Pandit-ji started teaching Hindi to the young boys of the Society, free of charge, as he believed that education should never be dissociated from life and spirituality. The 11th of June 1969 saw the culmination of one of his most cherished goals, the inauguration of the Dev Mandir, a unique temple where all the Hindu sects represented in the community have a place where to worship their God, freely and in harmony with the rest of the community. It was, thanks to Pandit-ji’s efforts, that their Majesties the King and Queen of Thailand graciously accepted the invitation to perform the inauguration ceremony, which was a great honour to the entire community.